So, I’ve been out of the loop for a while for a good reason. I’m starting a business, changing my body, changing my lifestyle, preparing for a new life! I know I say that a lot but it is always true. Reinvention is refreshing. Change is great! I am finished with two novels, shopping them and weighing my options. I’m saving my money so that I can incorporate and publish. I am living on a shoestring budget but I decided that I am ready to take a leap of faith and explore the gifts that I have been blessed with. So, entrepreneur I shall be. I expect difficulty but I’m willing to take the risk. 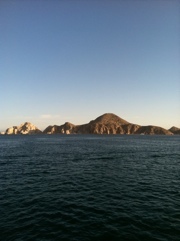 Recently, I had the opportunity to visit the beautifully sleepy desert paradise, Cabo San Lucas, Mexico. Fortunately, I was with a fine group of women who all have gifts beyond measure. We enjoyed the glorious sunshine, numerous shopping opportunities, laughter, bonding trough common experiences, and the freshest cuisine that I have tasted in a long time. We were there for four beautiful days in the sun and surf. I’m back home well rested and focused; feeling ready to take on new challenges. I’m definitely Cabo-licious!